John Bobek andTarah DeSpain in Bigfoot Movie, "Stomping Ground"
"Everyone, regardless of how much of a skeptic you claim to be, has a little bit of love for the Squatch inside them." --Stomping ground Kickstarter page. Fans, you know when Hollywood wants to promote a Bigfoot movie and spread the message to the greater public, they come to Bigfoot Lunch Club. The truth is, we don't always say yes. It has to be a well-crafted story and a novel approach to Bigfoot. 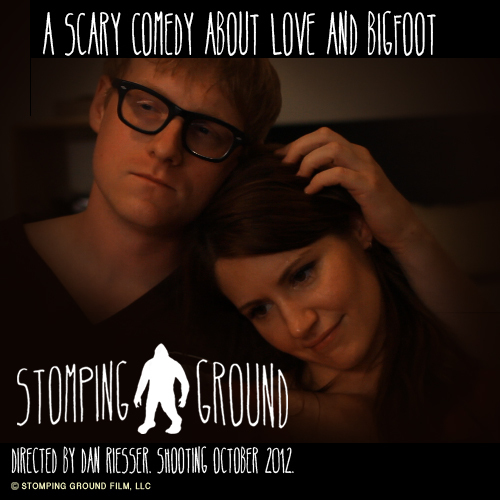 Stomping Ground is exactly the type of movie we say yes to, and they need your help to polish this fine film. Watch the video below from the Stomping Ground KickStarter Page. While we appreciate that you are still reading this post, by all means, go to the Stomping Ground KickStarter Page and make a pledge you can afford. The director, Dan Riesser, is a fan of Bigfoot Lunch Club and a producer on E! 's The Soup. Oh sure you know him from some of The Soup's funniest skits like the parody trailer for Dolphin Tale. You may have even seen his short film NightOfThePunks.com. Folks, this is a great time to get Stomping Ground on your radar, they have just recently finished shooting all the scenes and just need to finish up in post-productions. These guys know how to use social media, unlike previous independent films we covered. Stomping Ground has website, a Twitter page, A Facebook Page and even a Tumblr Page. They shot scenes in the same area Michael Green got his thermal video. Dan Riesser cares a great deal about the research community, and after several emails we can vouch for the respect he intends towards Bigfoot research in the film. Please visit the Stomping Ground KickStarter Page and make a pledge. Interesting Guy. Ill definitly check it out!